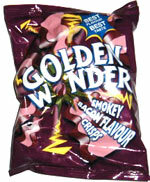 Taste test: A pretty good crunch, the bacon flavor isn't too strong, and you get a lot of crisps in such a small bag. The crisp isn't too oily, although there is some residue (either flavoring or potato bits) that will run off on your finger. The bacon flavor is strongest if you eat a handful of chips in one bite. Smell test: A pretty good bacony aroma permeates the nose.